Springtime brings warmer weather, greener grass and longer hours of daylight. It also brings one of the biggest challenges horse owners face: mud. It’s a dirty word, and it makes horsekeeping an ugly task. Mud presents a range of issues, from lost shoes to actual physical disorders, including skin problems, hoof problems and bacterial infections. Unfortunately, there’s no avoiding the season of mud—which extends to June in some areas. Horse Illustrated asked three veterinarians for their perspectives on common mud-related health disorders and how horse owners can best deal with them. Scratches, grease heel, mud fever, rain scald and rain rot all share something in common: They are horsemen’s terms for one disease, dermatophilosis, caused by the bacteria Dermatophilus congolensis. When dermatophilosis strikes the pasterns, horsepeople often call it scratches or grease heel; when it affects the horse’s body, lay terms for the malady include rain rot, rain scald and mud fever. No matter what body part it affects, dermatophilosis is characterized by scaly, crusty, scabby skin, and it’s a particular problem for horses that are exposed to moisture and muck for extended periods. When moist, soft skin’s protective layers are abraded by the coarse particles in mud, D. congolensis, along with other bacteria, and even fungi, strike at the opportunity to enter these susceptible areas. From there inflammation begins, and the skin’s normal barrier allows problems to set up on the surface and in the hair follicles. Before scabs develop, the body is already weeping oils (called exudate) as a reaction to the irritation. As the mud accumulates on the skin, the exudate is trapped and scabs form. 1. A pickup-truck load of large wood chips spread around water tanks and highly traveled areas keeps hooves from creating too much muck. 2. 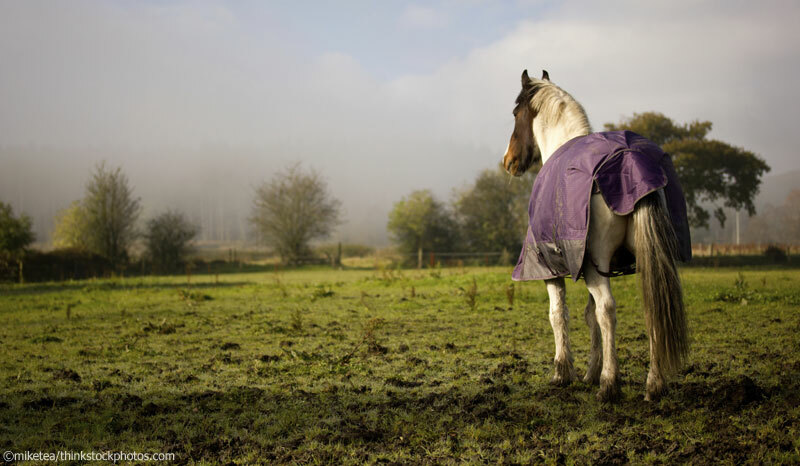 Stall mats or crushed gravel in a run-in shed gives horses a place to get out of the wet. 3. Year-round pasture rotation prevents overgrazing and the loss of ground cover. 4. Gutters on barn roofs can route water away from highly traveled areas. “Generally, there is a variety of secondary bacteria that can be involved,” says FEI-licensed veterinarian Duncan Peters, DVM, chair of the American Association of Equine Practitioners (AAEP) Owner Education Committee. Once the primary bacteria take hold, it opens the door for other bacteria and even fungi to enter. While every horse has the potential to be affected, those with white legs, those with either long hair or sparse hair on their cannon bones and fetlocks, and those that are turned out in the elements and not groomed every day are the most susceptible. These skin problems don’t usually leave any permanent damage. For horses with more aggressive skin issues, though, “the skin can be thicker in some of those areas, especially around the pasterns, and sometimes the hair will grow in funny,” Dr. Peters says. The best treatment for dermatophilosis is, of course, prevention. When the joys of horse ownership don’t include acres of mud-free turnout, a little elbow grease can go a long way. Daily grooming alerts you to changes in your horse’s skin condition. By knocking off the mud, there’s less opportunity for scabs to form. Stephen O’Grady, DVM, MRCVS, of Northern Virginia Equine in Marshall, Va., offers another grooming tip for especially susceptible horses: Keep your horse clean, and periodically rub mineral oil into his skin. “It acts as a bit of a barrier to mud accumulation and the scabs that occur,” he says. If a horse does become infected, treatment doesn’t have to be complicated. The first step is to keep the horse in a dry area, whether that’s a dry lot, a stall or a run-in shed. “Make sure that if it’s a run-in, the manure is removed, because if the horse comes in, having stood in muck and mire, and now stands in feces with all of its bacteria, then obviously, that’s a prime source of infection,” cautions William Miller, VMD, DACVD, professor of dermatology and medical director of Cornell University’s Companion Animal Hospital. The second step is to clip the hair around the affected areas and allow those spots to dry; gentle drying with a towel or low-heat hair dryer are other options. “Gentle” is key, however; scrubbing or scorching will only increase skin irritation and compound the problem. As far as topical treatments go, Dr. Peters says there are some good products out there. “Some have oatmeal or an aloe vera base; some may contain a benzoyl peroxide ingredient; some may be petroleum based, which tend to be excellent at removing scurfiness; some have alcohols or antiseptics as the main effective ingredient.” He says use of these products depends on what condition is being treated and how bad the condition is. But stay away from ointments, cautions Dr. Miller, co-author of the book Equine Dermatology. “When there’s a condition with bacteria or fungi, if you put too much ointment over it, it’s like putting the lid on the toothpaste tube, then trying to squeeze the tube. Instead of toothpaste coming out of the top and draining away like normal, it blows out the sides of the tube and gets into the skin. Choose your topical remedies wisely and carefully,” he says. Instead of a leave-on topical treatment, a mild anti-bacterial wash can be useful, but keep in mind the number-one treatment step: Keep the affected area dry. If scabs are plentiful, a once-a-day washing with Betadine surgical scrub or chlorhexidine, followed by thorough rinsing and drying, can yield good results. “As soon as the scab comes off, the moist or irritated areas will quickly clear right up. You’ve taken that covering off that allows the organisms to proliferate and cause problems,” Dr. O’Grady continues. From years of observing his own equine patients, Dr. Stephen O’Grady, who specializes in equine podiatry, believes mud also provides benefits to the hoof. “When the horse is in mud, the mud will accumulate in the bottom of the foot, almost mold to the shape of the bottom of the foot, and it will dry there. What you’re forming in the bottom of the foot is a dry, protective pad for the structures within the hoof,” he explains. The “mud pad” engages the natural physiology of the hoof, utilizing the shock-absorbing structures to decrease concussion. In addition, the pad protects the hoof from damaging rocks and debris. “The mud also acts as a wedge to keep the horse’s heels wide while he has his shoes removed,” Dr. O’Grady continues. Of course all of this assumes your horse is kept on large acreage, where he is less likely to encounter the harmful effects from standing in mire that contains waste. Leaving a horse to stand in manure and urine only introduces more nasty bacteria into the skin and hoof capsules. The bright side of mud is encouraging, but Dr. O’Grady still stresses the importance of picking out hooves regularly as part of your grooming routine to monitor their continued health and growth. Bacteria also find their way into the skin through minor wounds and set up a subcutaneous infection, or cellulitis. Horses with cellulitis experience swelling and heat in an infected leg. They will show signs of pain and lameness and often have a 102- to 104-degree fever. The fever is important to differentiate cellulitis from a run-of-the-mill lameness. Horses with severe infections will go off feed and show signs of serious discomfort. Their legs become extremely sensitive with inflamed blood vessels (called phlebitis). Although cellulitis isn’t a mud-related disorder, mud compromises the skin’s protective barriers against bacteria and keeps wounds soft and open. If you see signs of cellulitis, a vet call is necessary. Your veterinarian will most likely prescribe a course of antibiotics and instruct you to wrap the affected leg. If left untreated, the condition can last for months and wind up being very costly to cure. After the infection clears up, there may still be some residual changes. Dr. Peters has seen horses left with chronic circulation and performance problems and altered gaits. The hoof problems caused by mud vary depending on the type of mud, the length of time the horse stands in it, and—always a variable—the horse itself. Many hoof problems Dr. Peters sees at the LaSalle Equine Clinic in Kalispell, Mt., come from the horse standing in sloppy mud all day and then going into a stall and drying out at night. The wet-dry cycle causes brittle hooves that easily crack. Severe drying causes separation of the laminae (the material that links the bone and hoof wall) and opens the door to white line disease and abscesses. Horses in constant wet conditions suffer from soft soles and sloughing of the frog, which compromise the strength of the hooves’ support structures and can make the horse more prone to sole bruising. Thrush, while not caused specifically by mud, is more prevalent during the wet season. That nasty-smelling tar-like substance that indicates that a horse’s frog is rotting is caused by a bacteria common in manure. A mud-and manure-packed hoof is the ideal environment for this bacterial invasion to set up camp. Aside from keeping your horse out of excessive mud and moisture, maintaining sanitary conditions around the barn is important to limit his exposure to bacteria. Also, a regular four- to six-week shoeing or hoof-trimming schedule is essential for preventing hoof problems, whether they’re mud-related or not. Some horse owners also have good results using acrylic hoof coatings and hoof dressings to seal in natural moisture, while sealing out moisture and bacteria from the ground. Going overboard with dressings, however, can actually seal in too much moisture and even trap bacteria inside the hoof capsule. Moderation is key. Applications of iodine-based hoof preparations toughen up soft soles and draw some of the moisture out of too-soft hooves. Additionally, thrush-fighting products found in tack stores can knock out minor cases of thrush in a matter of days. If your horse is lame or the hoof problem has continued for a long period of time, you should consult your farrier or veterinarian for additional treatment options, which may include medication, management changes or special shoes. Lisa Munniksma, a freelance writer and marketing consultant, lives in Indiana. She’s been combating mud since getting her first horse 13 years ago. This article originally appeared in the March 2006 issue of Horse Illustrated. Click here to subscribe. This is a great article. Right now, I have a six-month-old colt that has something on his leg that looks exactly as it is described here. Thank you you so much! Now I know what to do if this happens! Mud has been hard on my horses this lat spring/summer. The horses hooves looked horrible for a while. I have read that if left untreated “scraches” or “grease heel” can leave the horse lame. Also this isnt just a mud problem. I have heard that horses can get “scraches” from tall grass cutting their pastern and then bacteria causing further issues. We dont have a lot of mud in our pasture and my horse has gotten pastern skin problems twice in the last few months. My horse Dreamer’s hooves were lookin a little rough but we had them trimmed and I have been grooming her and picking her hooves more and she is looking alot better. I LOVE this article thanks alot for the advice! I learned a lot. Thank You for the article. I was putting my horses out during the day (half the pasture is mud the other half is dry or snow and ice yet)and a dry stall at night. I will make some changes. You saved my horses from a potential problem. Thank you again!!! Thank you very much for this article on mud fever. I tried to explain this situation to a new inexperienced horse owner and he looked at me like I was crazy. Once I showed him this article, he was really grateful. Again, thank you very much. My horse Savvy has had problems with fungus. I trimed his fetlock hair and have been picking it off then washing and treating it, it is slowly going away. But my pony is in an even muddier pasture and he hasn’t got it at all and he has much much more hair around the legs. I think Savvy may have had it before I perchased him, but it got worse. It made his leg puffy and red from irritateing the skin, he also went lame. It’s not under controll and he can be ridden any day ofthe week with no problem. But fungus is a PAIN to get rid of more so if you have moist pasture, my advice, check for moist almost creamy scabs, if you find any pick them off (it’s ok if it hurts him a little and it’s actually better if he bleeds a bit.) wash the whol leg VERY well, dry it off then apply some sort of cream remedy(repeat repeat repeat!) I have been useing desidine diper rash ointment and it’s working wonders, whatever you do, don’t just give up and say “oh it’s fine now.” keep on it till it’s gone!